What could be more fun than a snowball fight -- in school?! 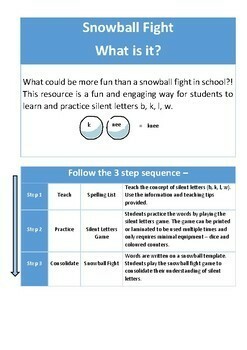 Snowball is a fun, energizing and engaging way for students to learn and practice any spelling words. 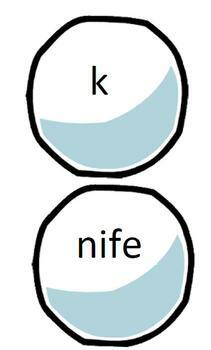 This resource focuses on silent letters. 1. Teach – the concept of silent letters b,k,l,w. 2. 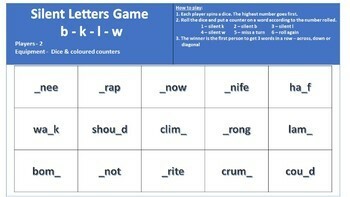 Practice – silent letters by playing the game 'Silent Letters Game'. 3. Consolidate – play whole class game “Snowball Fight”. 2. Students roam around the classroom finding the person who has the matching snowball that makes the completed silent letter word. 1. 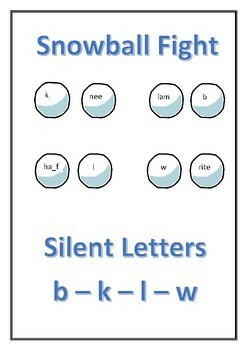 Print out all snowballs (30 altogether, 15 with silent letters & 15 with the word matches). 2. Cut each snowball out separately. 3. Mix up the snowballs well. 4. There are enough snowballs for 30 students – adjust the number of snowballs for the number of students in your class i.e. for 24 students use 12 words. 5. The game only works for an even number of students – the teacher can play to even the numbers. 1. Arrange students in 2 parallel lines facing each other on the opposite side of the classroom (or an outdoor/undercover area). 2. Give each child a snowball and ask them to scrunch the piece of paper up. 3. Students then throw the snowballs back and forth across the room randomly (not to any particular person) until the teacher says stops (10-20 secs). This ensures the snowballs are all mixed up. Play some energetic music while students are throwing snowballs. 4. When the teacher says stop, the students pick up a snowball, unscrunch the paper and read the word to themselves. 5. Students then wonder around the room trying to find the person who has their matching letters for silent letter words. 6. When they find their match, students sit down in their pairs until everyone is finished. 7. If the last 2 children do not match, this means there are wrong pairs and students will need to work out where the error has occurred. 8. Each pair of students reveal the completed word to the rest of the class.